Sammy, Sarah, Jennifer, and David organizers of ZAPPCON, with Zapp, the convention’s superhero! David Holland (right) has a love of comics and a passion for board games. He is a young professional who believes in his town and loves Fresno’s downtown and was recently named as one of Fresno’s Top 40 under 40. Having a degree in entrepreneurship and a love for business has been a great asset to the coordination and planning of ZAPP. Not to mention his experience as an event coordinator and strong connections in the community have been very helpful. Right now he is very into Green Lantern, Fables, Doctor Who, and more. Jennifer Ward (right) and her husband own and operate Crazy Squirrel Game Store in Fresno. Their friendly local game store celebrates its fifth year in business in 2015. Their organized events range from the area’s largest weekly Friday Night Magic to regional tournaments for games ranging from Warhammer 40K to their annual RPG two-day mini-con. Jennifer learned to read out of Richie Rich comic books, learned how to spell playing Boggle and Scrabble and dated her husband over board games. In her free time, she’s learning robotics so she can build a K-9 from Doctor Who. Sammy Gonzales (left) is a life long gamer and comics fan. In fact his love of video games and comic books were the only reason he wanted to read as a kid. He has been drawing comics since he was eleven when he started collecting Spawn. In high school, Sammy started playing Dungeons & Dragons and it was a pleasant surprise when his wife could role play, understood the game, and introduced him to her gaming circle of friends. Sammy continues to draw professionally, and when he isn’t drawing, he is usually following the latest trends in gaming, comics, and pop culture. Sammy is a professional artist and advocate of Fresno and all it has to offer. Contact Sammy at Sammyg (at) zappcon (dot) com. Sarah Gonzales (left) started playing Dungeons & Dragons and performing at renaissance faires when she was eight. Her Father taught her how to play cards, her brother taught her how to play Magic, and her sister taught her how to make costumes. The Hobbit was one of the first books she read by choice, followed by years of Dragonlance novels. Some early dates with Sammy included watching Warhammer 40K combats, 80’s movie nights, and listening to Harry Potter in the car. Their five children already love comics, gaming, fantasy, and drawing as much as they do. Sarah loves sharing with the community family friendly events that come to the valley. Contact Sarah at Sarahg (at) zappcon (dot) com. 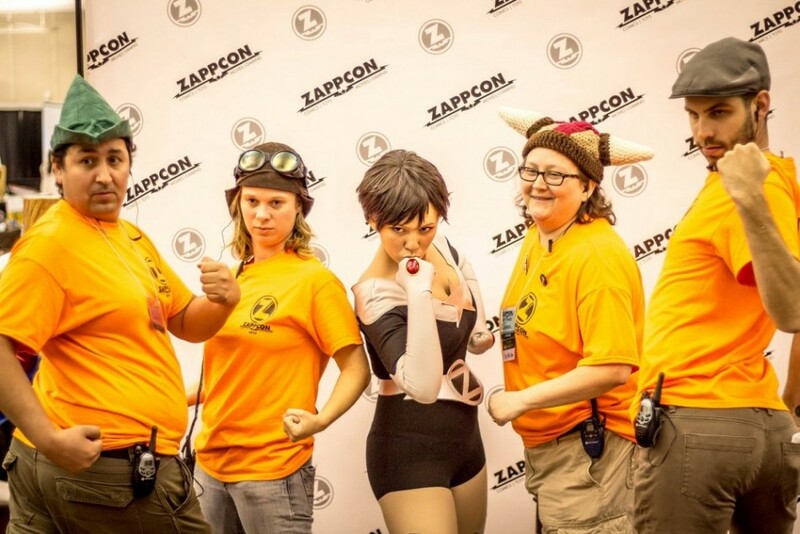 ZAPP (center) is ZAPPCON’s Superhero!